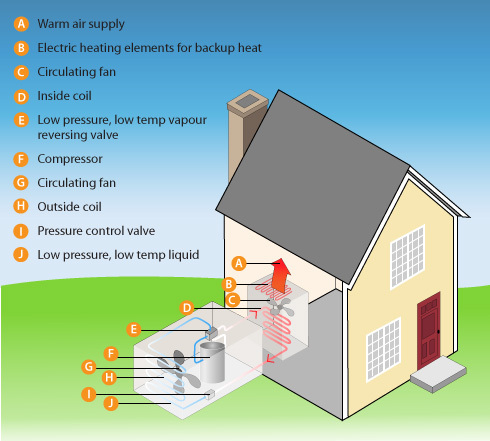 Heat Pumps: How Do They Work? | Pleasant Air Inc.
To cool your home, the heat pump transfers heat from the air inside the home to the outside air. To perform this function, a heat pump works like a central air conditioning system. It has three main components: a compressor, a condenser and an evaporator coil. These parts are responsible for converting the working chemical known as a refrigerant from a gas to a liquid and back again. The indoor unit, which contains the evaporator coil, removes undesirable indoor warmth and humidity from the air. The outdoor unit, which contains the condenser and compressor, rejects the heat that was captured indoors. The cycle of cooling begins when the refrigerant arrives at the compressor as a cool, low-pressure gas. The compressor squeezes the refrigerant and packs the molecule of the refrigerant closer together causing them to increase in temperature. The refrigerant leaves the compressor as a hot, high-pressure gas and flows into the condenser. In the condensing coil, the refrigerant releases its heat. A fan draws outdoor air in through louvers surrounding the outdoor cabinet and blows air across the hot coil. As the air blows across the coil, it transfers the heat to the outside air and cools the refrigerant inside the coil. When the refrigerant leaves the condenser coil, its temperature is much cooler and it has changed from a gas to a liquid. The refrigerant then flows indoors through tubing and passes through a small opening in the expansion valve. In this valve, the refrigerant expands and the liquid’s pressure drops and becomes a low-temperature, low-pressure liquid that flows into the evaporator coil where it evaporates absorbing heat from the return air blown over the indoor coil by a fan. At the same time, moisture in the air is removed as it condenses on the indoor coil. Humidity removed from the air, as it makes contact with the indoor coil, is collected in a pan at the bottom of the coil and flows to a drain. Refrigerant leaving the evaporator then returns to the compressor and the cycle continues. When the room reaches the temperature set on the thermostat, the air conditioner turns off. As the room warms up, the thermostat turns the air conditioner back on. When an air-source heat pump is heating your home, the cooling cycle is reversed. In the outdoor unit, the heat pump evaporates a low temperature refrigerant. As the liquid evaporates, it absorbs heat from the outside air. A heat pump can do this because heat exists in all air down to absolute zero (-460 F or -273 c). Even cold winter air contains heat. After the gas is compressed in the outdoor unit’s compressor, it passes into the indoor coil and condenses, releasing heat to the inside of the house. The pressure changes caused by the compressor and the expansion valve allow the gas to evaporate at a low temperature outside and condense at a higher temperature indoors. Most central heat pumps are split-systems, which means they have an indoor unit and an outdoor unit. Some heat pumps are packaged systems, which means they usually have the compressor, condenser, evaporator coil and the fan located outdoors in a single cabinet.